​Relaxation is the most important part of the day. How can your body and your peace of mind ever recover if you’re constantly working without a way to relieve the stress of the day? By kicking your feet up, laying back and enjoying a nice, relaxing casual video game session, of course! I’m a fan of gaming chairs that are big, roomy and are designed for relaxing in rather than competitive gaming. This chair is pretty well designed in that respect and the fact that it’s designed for larger folks is just the icing on the cake. If you want a comfortable experience while you’re gaming, this chair would be the perfect choice if your budget allows for it. It’s also pretty durable and looks like it’s built to last you a long time. Many hard-working people know this all too well. You come home to unwind and maybe you want to play some computer games or just relax. A lot of people come home to hard and uncomfortable gaming chairs that strain their neck and their back, leaving them mentally relaxed but physically exhausted. This is why a gaming chair with massage functionality built in is important to your relaxation. We’ve looked far and wide for the perfect gaming chair that offers a built-in massager and we think we’ve found one - introducing the KILLABEE Big and Tall 350 lb Gaming Chair! 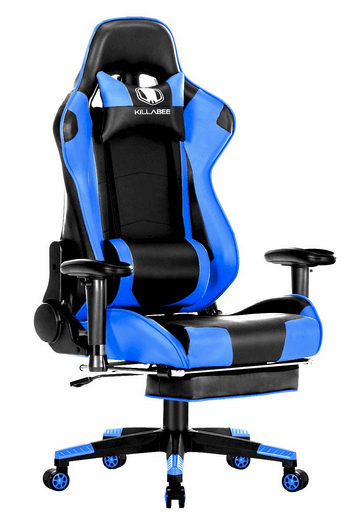 The KILLABEE Big and Tall 350 lb Gaming Chair is another brilliant KILLABEE invention for those who not only enjoy gaming but ultimate relaxation and spiritual recovery. 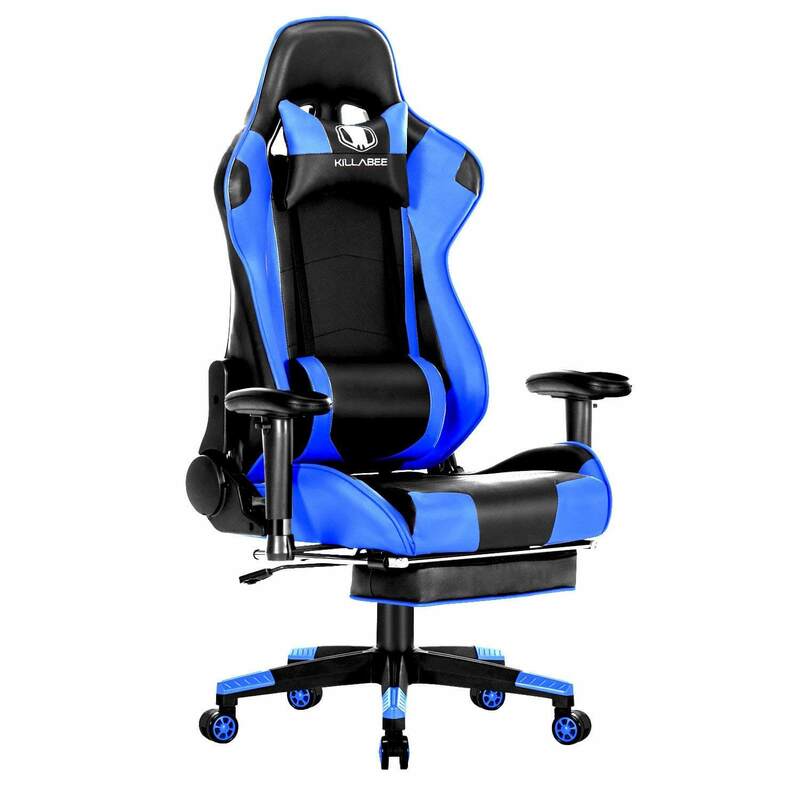 This chair is designed just like every other gaming chair on the market but has a built-in massager to help relieve and cure your fatigue after a hard day of work or a lengthy period of gaming. Massage chairs on their own can be absurdly expensive and overpriced, which is why we were so shocked to find not only a gaming chair but a massage chair built-in for the price this chair is offered. The motors used on this chair are well placed and fit in to the chair’s comfort profile in a way that gives you vibration along most of the backboard. The chair itself also uses high grade memory foam so as to keep the chair from deforming and losing shape after long periods of time. The memory foam also keeps the chair from deforming due to the stress it receives from the haptic motors that are installed within. The extra padding does tend to drown out some of the vibrations, but it still is a very comfortable experience. KILLABEE has always been looking for ways to change the game of gaming chairs or at least put a little innovation into the market. When it comes to gaming chairs, one thing that’s missing from the market are built-in massage units. While a lot of gaming chairs have lumbar pillows and headrest pillows, not many of them have a massage unit for extra relaxation. That’s precisely why this chair was put on the market and KILLABEE just found a way to do it for an exceptionally low price. The first and most important feature of the KILLABEE Big and Tall Chair is the electric massager built right into the chair, which is powered up via USB so you can just plug it directly into one of your computer’s USB ports, lean back and relax. The recline locking system on the chair was designed to allow you to lean back to up to 155 degrees and when the chair is tilted back, the massager still works so you can get a lumbar massage at any angle. Complimented with memory foam padding which sits just underneath the PU leather outside material. The memory foam will fit your specific shape and will return to normal once you stand up. The foam is incredibly soft and very resistant. 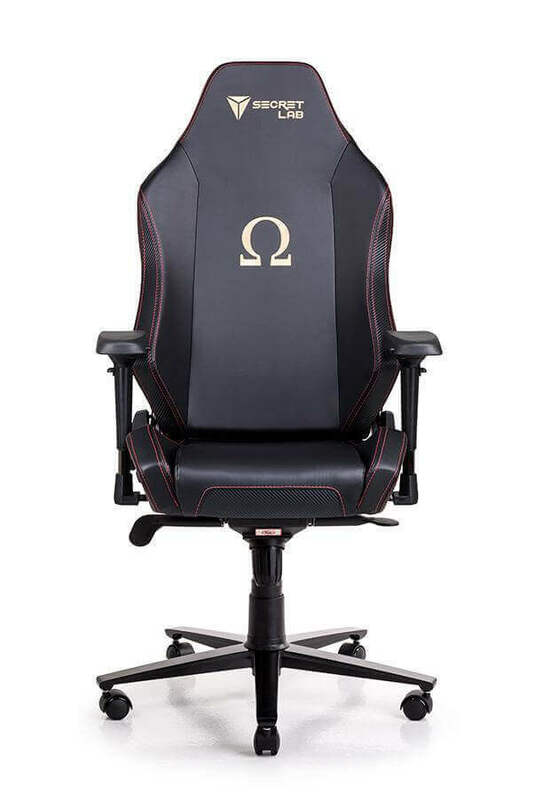 For the big and tall gamers, the backrest of this chair was made extra high, so that your neck and your spine can rest at ease while gaming. Also, the chair supports a maximum of 350 pounds, for the overweight gamer. The parts of this gaming chair are covered under a 1-year warranty for any doubts, concerns or if anything were to go wrong with the chair. ​The instructions for assembly are kind of worded poorly and aren’t very beneficial. The armrests do sit a bit further back than you’re probably used to, so it’ll take some getting used to but on the bright side, you can adjust the armrests to your liking in a few different directions. Also, memory foam while extremely comfortable does take some getting used to for people who’ve never sat in it before. I’ve only had this chair for about a week now but I really wish I would’ve ordered sooner. It’s really comfortable and it was really wide which was perfect for me because other chairs I’ve tried were too narrow. The instructions weren’t really clear for assembly but it was self-explanatory when it was out of the box. I am in love with this chair. I can sit in it for hours, it’s really comfortable and it was really easy to put together. If you’re not into the memory foam this chair has a zipper on the side that allows you to replace the foam if you really want to. I don’t have any complaints so far! ​If you’re looking to buy this specific chair, make sure that it comes from KILLABEE and not an impostor. A lot of low budget companies out there are trying to sell off-brands of this exact chair because of how popular it is. Also, make sure that a 1-year on parts warranty is included because that is a KILLABEE guaranteed warranty. Make sure to watch out for imitator chairs that don’t offer near the level of quality or comfort that KILLABEE does with this specific chair. As we said, it’s a relatively popular chair. ​We would advise ordering the KILLABEE Big and Tall Chair as soon as possible because this chair usually sells for several hundred dollars but it’s only listed for $199.99 at the time of this review Date 13th may 2018, which makes it an absolute steal and we’re frankly worried that they’ll run out of stock soon. From our experience, the chair can be shipped and at your location within just a couple of days, so it would be worthwhile to check out Amazon Prime when purchasing this product. ​The KILLABEE Big and Tall 350lb Massage Memory Foam Gaming Chair is a powerhouse on the market right now because it’s not too common that we see a gaming chair and a massage chair combined. You can lay back, relax and massage the fatigue away while you rest or game. The seat width, the armrest width and every dimension of the chair were made for the enjoyment of all customers, whether they’re big, small, tall or short. However, with the chair being 50% off from its original listing price, we don’t know how long that price will last and how long they’ll remain in stock for, so I would hurry if you were considering purchasing this chair.